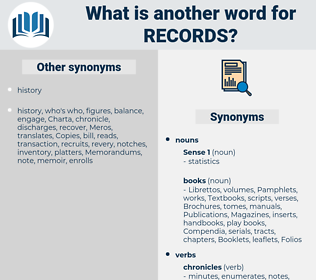 What is another word for Records? recorders, scorecards, memoranda, ledgers, annals, Inventories, logbooks, Journals, transcripts, stubs, recording, recordings, register, registers, Copies, Registries, dossiers, document, documents. recordkeeping, record-keeping, document, documents, recorder. renseignements, statistics, relationships, relations, certificates, Achievements, registros, cd-roms, credits, services, results, outcomes, fichiers, healthfiles, deliverables, numbers, mentions, notices, CDS, registos, phonograms, worksheets, letters, Databases, sessions, factsheets, MSDS, PRSPS, olympics, auditors, subjects, fiches, CPDS, exhibits, findings, phrases, Forms, features, sheets, Traps, sittings, figures, Resources, scores, agreements, meetings, registrations, instruments, Crimes, actes, particulars, topics, livres, outputs, volumes, acts, data, enquiries, pounds, Inquiries, banks. computerized, resource, Resources, matters, scores, conference, conservancy, documentos, administrative, electronic, conciliation, reading, differential, investigation, investigations, computer, environment, agreements, investigating, research, shrew, initiatives, secretary-general, offence, division, employed, deeds, archivos, ombudsman, reporter, transaction, director, instrument, instruments, Crimes, employment, investigate, service, c., supporting, names, intention, advice, extends, policy, printed, provincial, customs, heritage, DPR, Copies, actes, selected, system, des, PNR, PSHRMAC, great, Submitted, particulars, CPD, topics, actions, works, online, financial, management, section, external, free, livres, CRA, outputs, volumes, clock, acts, working, DND, proposals, appropriate, PRSP, TCC, rubric, data, norms, ain, enquiries, STC, white, FCCC, CMH, general, intent, lira, Kee, supplement, items, training, network, agency, latin, Strikes, pounds, mission, see, sees, assembly, inquiry, Inquiries, sets, chi, chair, /, banks, FPT, GBP, GST, Ina, They, PIBS, funding, staff, iv, panel, S, united, fund, Registering, registered, docket. renseignements, communications, representations, performances, receipts, careers, accomplishments, responsibilities, credentials, restrictions, circumstances, experiences, instructions, postcards, representatives, Rendered, statistics, purposes, commendations, inscriptions, condemnations, occurrences, relationships, distinctions, descriptions, relations, directives, requirements, endorsement, endorsements, repertories, Audiotapes, Videotapes, disclosures, destruction, verified, antecedents, labels, precedents, transactions, authorities, concerns, Voices, specifications, repositories, comptables, corrections, rosters, competences, vouchers, classification, trace, traces, recipients, dockets, processes, contents, certificates, videos, years, Establishing, observations, Containing, available, Remedies, enrolled, datasets, directory, requesters, stored, readings, credits, Tracks, history, Histories, notifications, approaches, 'archives, projects, Brochures, responses, sources, datafiles, lockers, indications, guidances, cahiers, productions, comptes, constituents, providers, results, outcomes, cylinders, decisions, Referrals, qualifications, measured, designations, complaints, profiles, bests, archivists, Perceptions, definitions, consists, Schedules, enrollments, indicates, scrapbooks, contracts, carnets, offences, supporters, deliverables, charts, contains, collections, personnel, Measurements, products, numbers, Insolvencies, entrances, comments, mentions, debriefings, crates, appellations, Guidelines, invoices, spreadsheets, Expenditures, developments, words, indicators, importants, provisions, enrolments, write, notices, CDS, incidents, reporters, extracts, crops, allegations, voters, electors, fields, phonograms, alternatives, terms, location, locations, arrangements, convictions, committees, discussions, Trajectories, roots, components, photographs, admissions, worksheets, footnotes, Testimonies, binders, remarks, dispatches, provides, challenges, attachments, checks, letters, Databases, advices, protocols, objects, quotations, sessions, postings, updates, fact-sheets, Areas, drafts, chapters, Pamphlets, livrets, supports, passengers, rules, quotes, factsheets, specimens, Scriptures, dealings, briefings, defects, issuances, constraints, telephone, DPRS, officials, manuscripts, expressions, organization, capture, estimates, deposits, footprints, diskettes, instances, altitudes, annotations, sightings, check-ups, Budgets, Obituaries, markings, police, Selections, balances, rates, Exercises, quarters, footsteps, Booklets, situations, priors, citations, benchmarks, Europeans, Biographies, harvests, Carriers, Adjustments, disputes, species, cards, nominations, excerpts, witnesses, Trademarks, writings, Populations, notebooks, fonds, workbooks, backgrounds, Interviews, limitations, checklists, dampers, testimonials, days, stores, systems, albums, downloads, birds, ratios, offices, pigeonholes, Deleted, rolls, Pleadings, passports, guides, portfolios, Permits, Properties, PRSPS, marks, Galleries, grades, notations, sanctions, aids, articles, sales, listings, newspapers, assessments, high, highs, rooms, substances, establish, aspects, Duties, debts, tricks, officers, beatings, auditors, pieces, subjects, patterns, advisories, audits, points, fiches, inlets, priorities, Censuses, wording, wordings, Movements, CPDS, envelopes, exhibits, warnings, only, FORMATS, playbacks, brands, individuals, sections, STATS, version, versions, showings, rises, affairs, questions, departments, alerts, findings, appeals, LIDS, accountants, Indexes, Indices, phrases, ENTS, opinions, speeches, tickets, gates, raids, Patients, levels, Treaties, cages, merits, Boxes, leads, highlights, appears, Textbooks, journalists, entrants, meters, licences, Stones, none, bills, Appendices, expenses, fronts, nobody, Vehicles, Forms, users, sentences, SPARES, hold, leaflets, Analyses, events, Coins, Templates, features, Persons, jacks, sheets, views, scripts, Languages, civilian, media, Clients, Entities, status, tiles, Wars, Foundations, Companies, seats, Fees, warrants, hikes, Photos, tokens, things, elements, burns, place, places, PATHWAYS, digits, links, cars, Arising, Studies, supplements, packets, parts, signs, false, Paths, samples, messages, bids, Programs, themes, attacks, markets, racks, inflows, quid, calls, Seizures, Punishments, images, Tales, Maps, intakes, Traps, spanish, Levies, Essays, inputs, PAGES, sittings, demands, pots, Penalties, Focuses, arrivals, scans, stops, payments, texts, ratings, funds, blows, Leaves, LEAFS, Shots, loans, bins, plans, summits, trials, monographs, flows, figures, Gains, stalls, counts, 133, tasks, types, shows, 2007, releases, symbols, talks, sites, states, flags, Plays, tabs, paragraphs, lb, LBS, plugs, ages, 29, kits, Resources, visits, :, 70, matters, Guns, news, Backs, scores, goods, documentos, Parties, investigations, agreements, meetings, initiatives, units, deeds, instruments, Crimes, names, particulars, topics, actions, works, livres, outputs, volumes, acts, proposals, data, enquiries, items, pounds, Inquiries, sets, banks, PIBS, Registering, registered. Issued, contained, used, Appeared, published, paid, found. 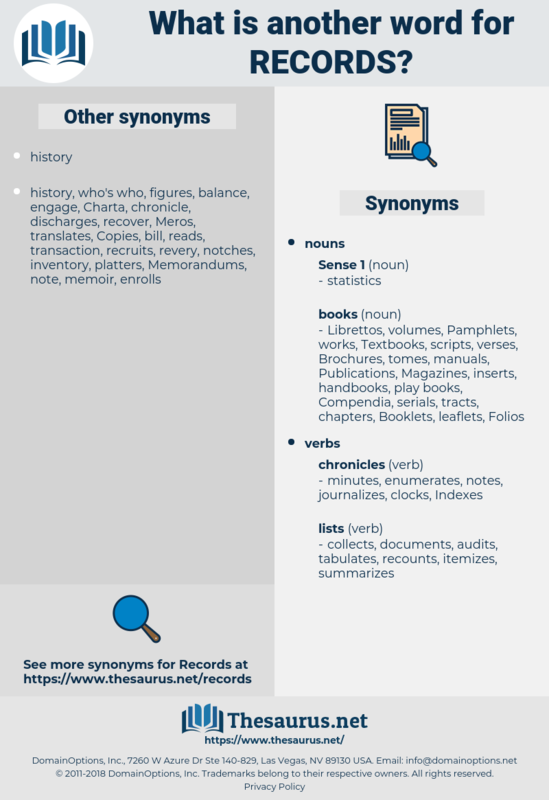 produces, recognises, recognizes, reiterates, incorporates, evidences, collects, recounts, Recalls, describes, chronicles, represents, comprises, covers, receives, includes, demonstrates, opens, reflects, exists, observes, reminds, reads, identifies, reaches, complete, writes, occurs, remembers, experiences, accrues, rule, refers, lectors, enters, captures, suggests, achieves, embodies, suffers, relationships, informs, incurs, enjoys, monitors, outlines, continues, Does, understands, presents, establishes, stamp, vouchers, dockets, closes, saves, assigns, Faces, specifies, Tracks, 'archives, holds, tells, results, maintains, says, is, consists, indicates, contains, signals, mentions, Gives, provides, attachments, Databases, Has, falls, takes, finds, estimates, keeps, runs, stores, marks, becomes, exhibits, ENTS, leads, appears, Journals, status, seats, burns, gets, figures, counts, shows, Plays, kits, matters, documentos, registrations, makes, des, particulars, works, volumes, acts, data, note, sees, sets, S.
TAPES, albums, registers, dossiers, archives. order, registration, registrations, bookings, register, registers, Registries, dossier, dossiers, registry, archives. documentations, orders, documentaries, declarations, successes, presentations, TAPES, Ones, registrations, archives. registration, register, registers, archives, registered. 1794 - In 1794, as old records say, the first American arrived, landing from a ship and settling in Santa Barbara. Some of the stones of the old Abbey yet bear traces of the fires by which the ancient building was so often nearly destroyed, and in these frequent conflagrations all records, charters, etc. rearguard, recorded, regret, Richard I, ragwort, recruit, raw recruit, rice rat, racecard, rag gourd, ricardo, resort, re-create, Richard Iii, regard, reassert, Raja Radiata, race riot, recreate, reassured, rose-root, rough-haired, Richard Ii, required, rose-red.